Ms. Hacala’s perspective is neither legal nor legislative, but rather civil in all senses of the term. She writes as a member of society who is simply appalled at the carelessness, nastiness and apparent tolerance of meanness that she sees around her. Public displays of vulgarity and loud confrontations are things that, in very recent times, were broadly frowned upon and parentally punished. Yet as we know famous tennis players curse at umpires; members of Congress call the President a liar; rap stars interrupt awards shows to curse. Expressions of individual emotion are unfiltered by the sense of social obligation – the recognition that there are those more important than ourselves – that, to Ms. Hacala, characterize all societies, including ours until very recently. Among many factors contributing to the loss of civility, one of the most telling is a “disconnect,” a state of existence in which one is in, but not among, one’s neighbors – that the society we live in is someone else’s, which we are somehow visiting but not a part of, and not responsible to advance. Through email we “contact” but don’t “connect.” The concept of “exchange” gives way to mere self-expression, and group discourse devolves to a sequence of statements of personal interest. 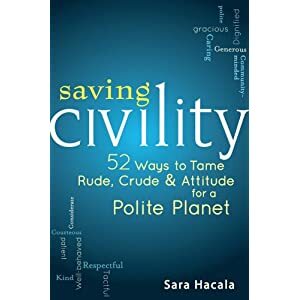 One might observe that, if people like Ms. Hacala need to “teach” civility, then we don’t have it any more. But it’s always useful to listen to people who have thought a long time about important topics, and it is not only instructive, but civil, to give Ms. Hacala heed. She encourages us to be intentional as members of our neighborhoods – to live in such a way as to engage in civil behavior. She asks us to greet others with a smile; to be sensitive to the way others perceive us; and to respond when others speak in a way that they know they have been heard. She urges us to interpret others’ cares sympathetically; to use discernment rather than mere receptivity in our dealings with each other; to speak perceptively; and to know when to be silent. She reminds us of the social utility of trust. She urges us to remain placid and avoid both belligerent tones of voice and rhetorical turns of phrase. She sincerely reminds us that shared laughter, shared kindness and shared enjoyment is the very mortar of societies that work well. Generosity is important; so are gestures of gratitude. This all may sound schoolmarm-ish. Yet who can contest any of it? And isn’t it good to be reminded? After all, is it President Obama’s job to legislate civility? Is it the Republican Party’s job to enforce it? Or is it our job to live it? I am a recent follower, happily, of you well thought out blogs. This one touches upon an important subject that has its roots in how we are brought up as children. My concern is that if an underlying repect for others views in not inculcated at an early age, books and articles are not going to have much of an effect in bringing our culture back to a more civil discourse. A recent article about the London riots made the point that the rioters didn’t seem to be making a civil statement since they looted stores of things they wanted (e.g., computers) and left other, less desirable stores untouched. This can be explained by the fact that so many of us (me included) were brought up in a broken home. While my mother did a good job of instilling basic morals and ethics, I’m concerned that today we have more broken homes and a culture that does not provide for moral and ethical training. Video games, for example, are teaching killing instead of peaceful resolutions. The London riots could be looked at as a harbinger of things to come in the U.S. I am constantly depressed at the lack of basic courtesy that seems to be drifting into the legal profession: aggression is often a defence mechanism for the less able or poorly prepared but in some firms rudeness seems to be taught. I was teaching a mediation module at a rapidly growing commercial firm and was told these young lawyers had been told to abandon common courtesies such as using ” Mr” or ” Professor” when writing to people they had never met as that was old fashioned and that even beginning an email “Dear” is uncool in the commercial world. It is not my experience of the commercial world but I am sure these thrusting modern firms know better. It is however noticeable that complex deals are more easily and swiftly resolved with the more traditional courteous firm while the rude end up causing impasse and looking silly. Still causing problems adds to the time they can bill or am I being cynical….. Looking at the second to last paragraph I am struck by how many of her prescriptions are basic rules of conduct in a mediation, and reflect the communication skills mediators bring to a stuck conversation.